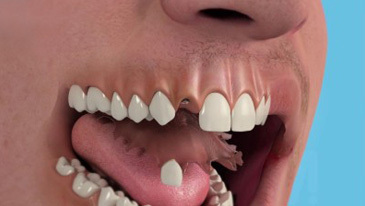 DB was missing his front tooth following trauma and was wearing a denture. he was keen to have a fixed restoration for the gap. An implant was placed with a ceramic crown attached. The implant was placed and left to integrate for 3 months. Moulds were then used to have the crown fabricated. 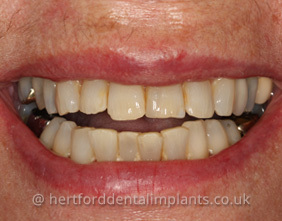 Photos were sent to the technician to create a perfectly shaded crown to match the other front tooth. 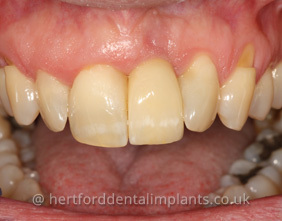 MB had previously had his upper front tooth extracted and was keen to have it replaced with a fixed implant restoration. Due to a lack of bone volume, it was necessary to carry out a bone graft procedure to increase the bulk of bone. 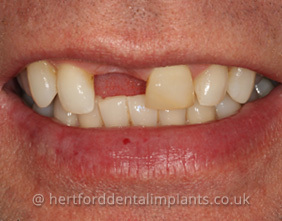 A single implant was then placed and restored with a crown alongside the adjacent front tooth. The bone graft was carried out and left for 4-5 months before placement of the implant. 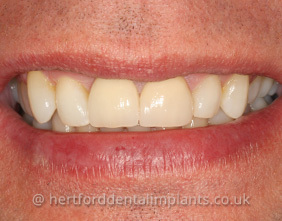 Following another 3 months for integration of the implant, the final crowns were made and bonded in place. CH had to have her tooth removed due to a fractured root. 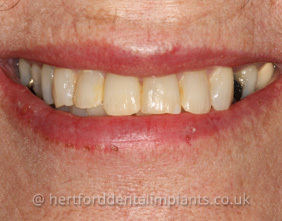 Due to good bone volume, a routine implant placement was carried out and restored with a crown. 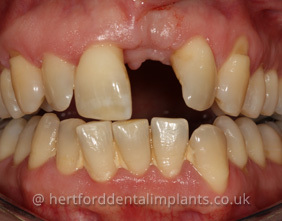 The implant was placed and left for 3 months before moulds were carried out to have the final crown made a few weeks later. LB was missing a lower molar and frustrated with food getting caught in the gap while eating. 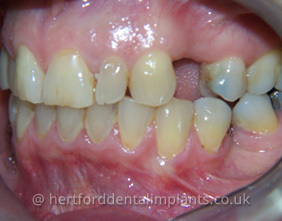 Following diagnostics, a single implant was placed and restored with a ceramic crown on top. The implant was placed and left to integrate for 3 months. 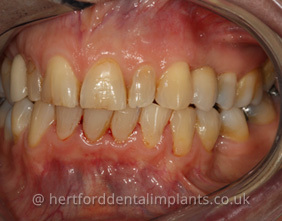 Moulds of the teeth and implant were then used to have the final crown fabricated and attached to the implants 3 weeks later. JS was missing the tooth due to a root fracture and was unhappy with the appearance of her smile with the gap. 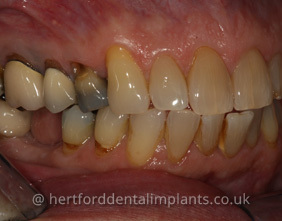 An implant was placed and restored with a ceramic crown. The implant was placed and left to integrate for 3 months. 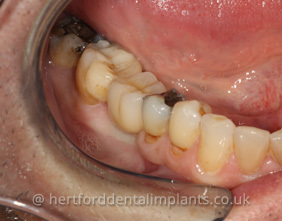 Moulds were then used to have the final crown made which was attached to the implant 3 weeks later.